Are you trying to lose weight or starting on the road to meal planning? I will freely admit, meal planning is one of those things that has always been very challenging to me. While I love to cook, sometimes planning more than a week ahead is extremely challenging, especially with my busy work schedule. One of the things that I have been reading that is great for busy people like me is meal prep. Not only does preparing your meals ahead of time help you save time and money, but losing weight as well. You can even focus on portion control, something that is always challenging when you are always on the go. 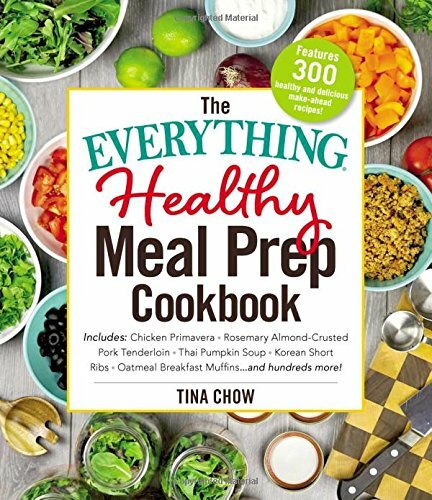 Since I know this is something that I can work on, I was excited when I had the opportunity to review a brand new cookbook – The Everything Healthy Meal Prep Cookbook by Tina Chow. Learn to prepare healthy, portion-controlled meals for the week with this easy-to-follow cookbook that saves time and can help you lose weight. Meal prepping has quickly become one of the best ways to control what you eat and organize your eating habits. In The Everything Healthy Meal Prep Cookbook, you’ll learn how to plan out portion-controlled, nutritious meals and prepare them in advance—so when the time comes for dinner, it’s a breeze to whip it all together. You’ll discover the benefits of meal prep and learn how to do it effectively so you are always eating something different and never bored. With 300 delicious recipes included, The Everything Healthy Meal Prep Cookbook can help you have more control over what you eat and provide a clear, focused path for dinner. As someone who knew she had a lot of work ahead of her with meal prepping, I have to say that this is a very useful book. Before jumping into the recipes, the author goes into various tips, how to items, and things overall to help you make meal prepping a success. Unlike most authors, she is very down to Earth with her advice and makes it seem so very simple (a plus for someone busy like me). The recipes themselves are also very easy to follow. My only complaint is that I wish there were a bit more pictures for various recipes. Overall though, I do think it is a great beginners guide to meal prep, making The Everything Healthy Meal Prep Cookbook a great book for any busy foodie. Would you like to purchase this cookbook for yourself or someone you know as a gift? You can buy The Everything Healthy Meal Prep Cookbook on Amazon.com for only $8.99 on the Kindle or $13.08. We are certain that once you try this book, meal prep will seem so much easier!